Marathon day is fast approaching, but don’t stress – Nick Anderson from RunningWithUs has provided a TON of tips for anyone who’s worried they’ll forget something major on the day. Check out all his info below, but the main thing to remember is enjoy the day! You’ve worked so hard, so don’t forget to soak up all the memories you’ll be making on April 22nd. Have your normal pre-long run breakfast. You might need to pack and plan this in advance if you are staying over in a hotel. Graze on your breakfast over a 20 minute period. Nerves can make your rush it, which can cause digestive discomfort. Aim to eat 2-3 hours before the start of the race and take a small snack such as a banana or an energy bar to eat 75-90 minutes before the gun. Keep control of your nerves. Spend some time in a calm space, remind yourself that you have the training in the bank, positive thinking now will bring you’re your best performance. Aim to get to the start a minimum of 75 minutes before the gun goes. Ideally even a little longer – and plan your logistics well in advance. Wear old clothes to the start as it can get cold at Blackheath as you wait in your pen. Maybe consider a bin bag to wear if it’s raining. You will soon warm up as you start to run so take care to not wear too many super warm clothes to run in. Arm warmers, gloves and hats can be great options as they are easily removed as you start feeling warm. Ditch the warm up. You have 26.2 miles to get into your running and if you spend time in the holding area warming up you will only need to stand still again when you get into your pen – save your energy. Remember it’s a race about you against the distance – start sensibly. Running a good race is all about pace and patience. Aim to run the first 5-10km either at your goal race pace or even a few seconds slower. If you are not worried about time work at the speed of chat. Most people hit a wall in the marathon run running the first 15-20km too hard. Stay in control but enjoy the atmosphere and excitement. 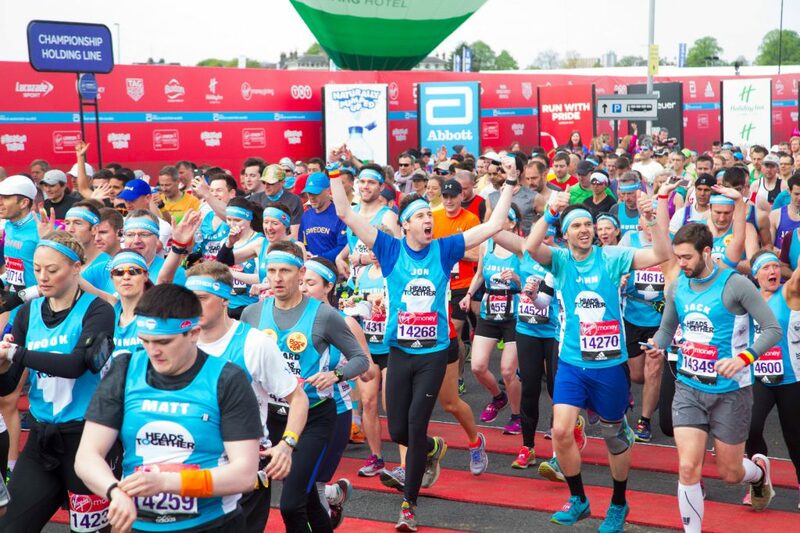 The crowd through Cutty Sark and on to Tower Bridge will make the hairs stand up on your neck and you’ll feel like and Olympic champion – take a breath and hold your pace back! Don’t rely heavily on your GPS for pacing every mile. With the other devices around you and big buildings in Canary Wharf, they don’t give you accurate readings. Rely on your sense of effort and a simple stopwatch and pace band if needed. Manage your energy and fuel economy. Aim to take on gels consistently starting after 45 minutes the one every 30-40 minutes after, sipping on water but not drinking too much or more than your need. Be aware of what others are doing. Avoid debris at drink stations and run even pace – try to avoid weaving around other runners as you’ll add masses of extra distance as a result – the marathon is long enough. The race starts at 30km – everything to that point is just transport. Try to protect your energy levels so that you can throw everything at the final 10-12km. Through the final 10km, focus on the km your are in. Perhaps dedicate every mile or km to someone important in your life – you won’t let them down when it really counts. Focus on a vest in front and aim to pull in and pass the runners ahead of you. Keep your posture tall and relaxed. When you cross the line pump your fist in the air, soak up all the atmosphere of those incredible final few miles! Then keep warm, get your kit and get some carbohydrate and fluids into your system as quickly as possible. Good luck and we will see you at the expo!